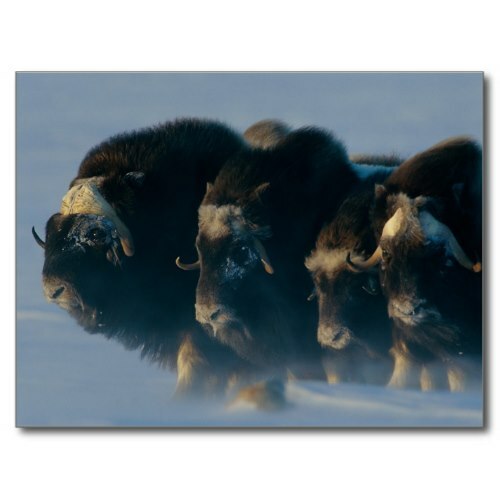 A herd of Musk-ox, Ovibos moschatus, huddle together in a protective formation, in chilly winds. A beautiful National Geographic photo, featured here on a photo postcard, taken by Norbert Rosing. Musk-oxen have this distinctive defensive behavior - when the herd is threatened, the bulls and cows stand shoulder-to-shoulder in a circle, with their young in the middle, and their sharp horns facing outward towards their foes.